Eyeglasses have been a traditional solution for correcting vision problems for many centuries. When contact lenses arrived on the scene, they offered a new practical solution for restoring vision. Now an increasing number of eye surgery options emerged as another exciting alternative to glasses or contacts for clear vision. Advanced technology has made it possible to reshape eyes and restore clear vision for many people from all walks of life. Surgical techniques and tools have rapidly evolved over the past two decades to create procedures that are both safe and helpful. Corrective surgeries for eyes now include everything from using lasers to reshape the cornea surface to inserting artificial lenses. These procedures correct how light entering the eye is processed – leading to much sharper vision in patients. Ask your optometrist at Norfolk Family Eye Care if your a candidate for any corrective surgeries. 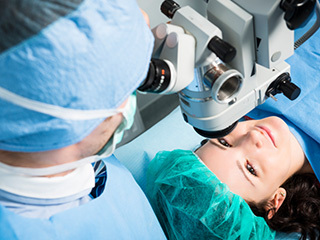 Laser correction surgeries offer a snapshot of evolution in eye surgeries. Photorefractive Keratectomy (PRK) became the first successful surgery to change the shape of the cornea through removing tissue. The FDA approved PRK in 1995 and it is still widely used as an alternative procedure to LASIK if the cornea is thin or has scarring. With PRK, the front surface of the eye has to regenerate so it takes a few days for vision improvements to be realized. LASIK followed on the heels of PRK. It involves cutting a thin flap in the outer covering of the eye to reshape the cornea. Unlike PRK, it only takes a few hours to gain sharper vision with LASIK surgery. LASIK can be done with the aid of a mechanical cutting tool to create the flap or lasers now create a more precise flap. Wavefront technology, that measures how light hits the eye allows ophthalmologists to correct vision more optimally than glasses or contacts. Some eye surgeries require implanting new artificial lenses to produce vision improvements. Implantable lenses similar to contact lenses can correct more severe levels of nearsightedness. These artificial lenses go permanently over the natural lens on the eye. Refractive Lens Exchange (RLE) takes it a step further and replaces the natural lens with an artificial lens of a different power to correct extreme farsightedness. Our eyes change as we age, a are very important factor when considering if a corrective procedure is a good option!. People under 18, for example, are not good candidates for corrective surgeries because their eyes may change as their bodies are growing and maturing. People over age 40 start to experience the need for reading glasses or multifocals as their near focus gradually declines so the optometrist will consider this when recommending corrective surgeries. Health also factors into eye surgeries. If you have diabetes or other medical conditions or take certain medications that may impact eyesight and eye health, then corrective surgeries may not be an option.